Martha Wells is one of those "where have you been all my life writers" having only discovered her last year with The Cloud Roads. But the best thing about finding an already established author is they have plenty of older works to tide you over until the newest book is released. She is the author of twelve novels, including the Nebula-nominated The Death of the Necromancer, as well as a number of short stories and nonfiction articles. Her first novel, The Element of Fire, was published by Tor in hardcover in July 1993 and was a finalist for the 1993 Compton Crook/Stephen Tall Award and a runner-up for the 1994 Crawford Award. The French edition, Le feu primordial, was a 2003 Imaginales Award nominee. Her third novel The Death of the Necromancer (Avon Eos) was a 1998 Nebula Award Nominee and the French edition was a 2002 Imaginales Award nominee. Her most recent release is the Fantasy The Serpent Sea, sequel to The Cloud Roads, both from Night Shade books. MH: Thanks for joining us today, Martha. You've now published about a dozen novels and been nominated for numerous awards including the Nebula. Was there ever a moment when you felt like you made it as a writer? WELLS: Not really. There are a lot of moments that stand out for me. Nothing beats finding out you've sold your first novel. Except possibly finding out I had sold The Cloud Roads and The Serpent Sea after a three year sales drought. Finding out I was nominated for the Nebula award for The Death of the Necromancer was wonderful, once I'd been persuaded to believe that it was actually happening. My mother had been diagnosed with Alzheimer's that year, so it was a very stressful time, and that was one of the few bright spots in the year. Nowadays, unless you have a super-mega-hit bestseller, I don't think you ever make it as a writer permanently. I think you have to make it all over again, prove yourself all over again, with each book. MH: The Cloud Roads portrays a world with a seemingly endless history of immense cultures and species that have risen and fallen. There are no humans per se in the world, but many that are humanoid. What made you want to develop this world in such a manner? WELLS: I wanted to do something different. The last fantasy novels I'd written were the Ile-Rien trilogy, where I was working with two different worlds: Ile-Rien, which was heavily based on 1920s France and Europe in general, and already had a background of history that I'd established in The Element of Fire and The Death of the Necromancer, and the alternate world of Cineth, which had Greek and Roman influences and a more sword and sorcery feel. I did enjoy using historical settings as inspiration, but I felt like it was time to really push myself to do something beyond that. I also wanted to get back to the SF/F novels I'd read when I was growing up, the ones I used to find in the library when I should have been staying in the children's fiction section. The ones with wild pulp covers and two moons and people riding animals with three eyes and horns and being green for no reason. I really enjoyed those books, and I wanted to recapture that sense of wonder, and that feeling of starting out somewhere strange and travelling somewhere even stranger. That's always been one of my favorite things about SF/F. I like to read about places where I have no idea what's going to be over the next hill or around the corner. MH: Is it any different or harder to write so many non-human characters. Most Fantasy books have at least one focal human while the Raksura books don't feature any. WELLS: I don't think it's different or harder. I do the characterization in basically the same way. I try to think about what this person's life would be like, what their likes, dislikes, loves, fears, and so on would be. All that is affected by physical appearance and abilities, the environment where the characters live. When the person you're characterizing isn't human, you just have to use more of your imagination. MH: You just recently finished the first draft of the third Raksura book. Any details you can tell us? Title perhaps? 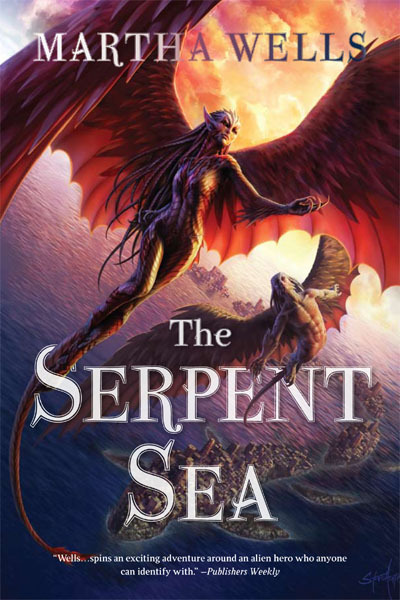 The Serpent Sea sees Moon and company travel to another colony. Are things getting more Epic? Do we get to learn more mysteries of this world? WELLS: I actually haven't decided on a title yet. With every book I've done, I either hit on the title effortlessly at some point while I'm writing it, or I finish the book without a title and agonize over trying to pick a good one. With this book I'm in the agonize stage now. There is a lot more in it about Moon's past and what happened to the court he originally came from, and it brings the whole story full circle, I think. They encounter the Fell again, too. MH: By the same note do you see yourself doing anything else placed on this world? It seems so rich that you might be able to even do something in the deep past of the world given how many cultures have risen and fallen over the eons. WELLS: I think that's a definite possibility, and I know I'd like to do more books set there, either with the Raksura or with another set of characters. It's a fun world to explore. I have written one short story set in the Three Worlds with different characters than the books. It's "The Almost-Last Voyage of the Windship Escarpment" and it's posted for free on my web site. MH: You just announced you've got a contract for the third Raksura book so big congratulations are in order! Do you have any celebration rituals when you sell a new book? WELLS: Thanks! I don't really have any one thing that I do, except collapse in relief. Usually I go out to dinner with my husband, but the day I got the email about the third book, I was about to leave to drive to ConDFW in Dallas. So it was a lot of fun getting to see some friends there and tell them in person. Going to a convention is a great way to celebrate! WELLS: I've been given a lot of great advice over the years, but I think the best critique I've had was from Bruce Sterling at a Turkey City Writers Workshop in Austin, Texas. This was a few years before I sold my first book, and I'd been trying to write short stories. He was very good at breaking down the prose and telling you exactly why this one sentence worked and exactly why this one didn't. It was the most helpful workshop I ever went to. MH: You've published a couple media tie-in novels in the Stargate universe. Is that something you'd consider again? Was it very different from writing your own original fiction? WELLS: I wouldn't do it again unless it was a show I loved as much as I did Stargate: Atlantis. I'd been watching SG1 since the first season, so I was already a big Stargate fan when SGA started airing, and the first season had me hooked. The only thing that was different from my original fiction was that I had to work hard to match the character's voices to the actors' performances, and to make sure I was getting the details of the technology right. I felt a big obligation to try to get everything right, and to come up with an adventure that would mesh with the kinds of things they do on the show. I really enjoyed writing those characters, so I had a lot of fun with those two books. It was very different from what I had been writing in my fantasy novels, and I think it was a creative break that I really needed. MH: Many people discuss how e-books are the future and you've been re-releasing many of your older titles. What has your experience been like so far? Do you feel like they've helped your career and exposure in some way? WELLS: It's been a pretty good experience. 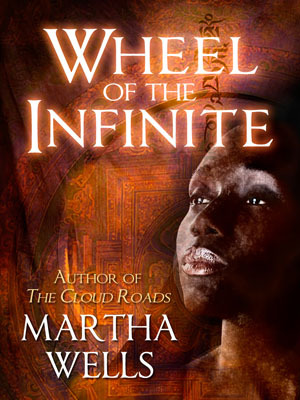 The one that was the most work was Wheel of the Infinite. I didn't have a Word file of the final version of the book to use, so I had to cut apart a hardcover to scan it. That was a surprisingly unpleasant thing to have to do; destroying a book felt very, very wrong, even though I was doing it for a good reason. I don't think having them available has helped my career or exposure any. I think they're mainly found/bought by people who are already searching for my name on Amazon or Barnes and Noble. It's mainly nice to have them still easily available to new readers who have read The Cloud Roads or The Serpent Sea and want to check out my older books. WELLS: I have a floppy canvas hat that I love, mainly because I can roll it up and cram it into a pocket without hurting it. MH: What's the book you're most looking forward to this year? 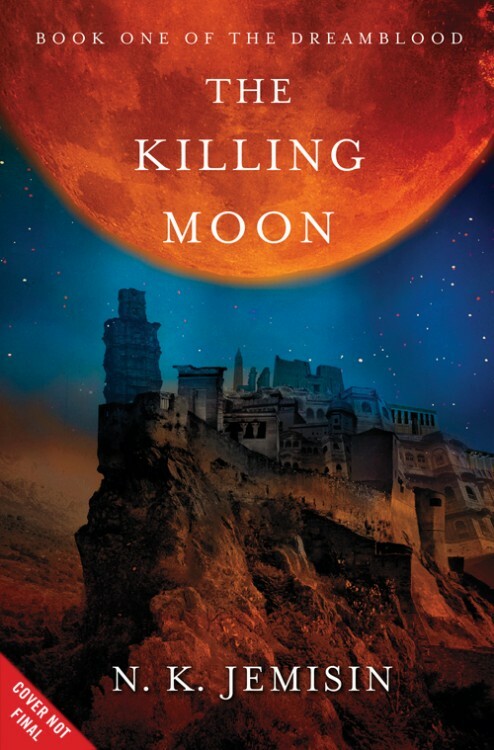 WELLS: There are a lot of books I'm looking forward to, but I think the one that's coming up the soonest is The Killing Moon by N.K. Jemisin. MH: That's on my list as well. Is there anything you like to add to close us out? WELLS: My web site is http://www.marthawells.com and has sample chapters of all my books, free short stories, and lots of other stuff. 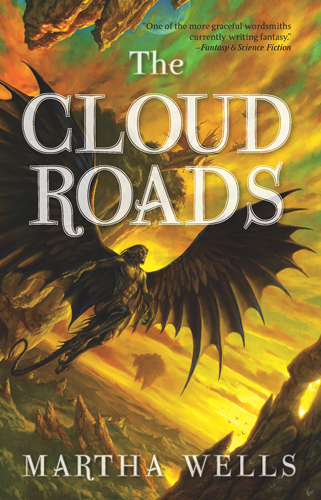 I also just put up an "extras" section for The Cloud Roads and The Serpent Sea, with the short stories, a missing scene from The Cloud Roads, some information on the world, etc. It's at http://www.raksura.com. I have been a long-time reader of Martha Wells and have nothing but good things to say about her works. I only fault her for not writing enough! More, more, more. I am really looking forward to her third book in the Raksura series, but we have to wait until 2013. She also just finished a section on her website dedicated to the three worlds in the books for us fans. I haven't read some of her latest books, but I've been a big fan of Martha Wells ever since I read The Death of the Necromancer when it came out in 1998--seminal Steampunk before the more recent swell of popularity. Can't recommend that one enough. The Element of Fire and City of Bones are also excellent. One good thing about doing a Google search on fantasy is finding an interview like this one. My first question was: how do I not know about this author already? Great interview with a lot of tempting titles and a nice hat Q&A.